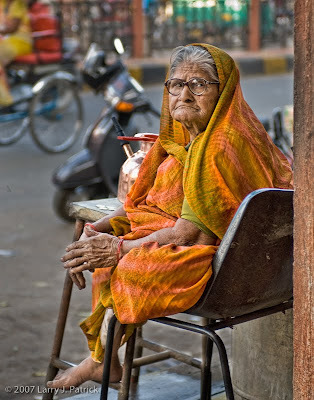 This lady was selling tea just outside the train station, and although she does not look it, she was a bout as sweet a woman as you will ever meet. JD and I stopped and had some tea and she had to tell us all the things that we should and should not do on the train. After talking to her for about 15 minutes, I fully expected her to tell us to call her when we got there. Camera settings: Nikon D200, Nikon 28-70mm f/2.8 at 70mm shot at ISO 200, f/2.8 and 1/80th of a second. Photoshop—used nik Color Efex tonal contrast filter to add contrast to highlight, mi-tones and shadows to her dress. I like the colors and composition and the way you simplified the potentially distracting background! In spite of the possibly distracting items in the background you've managed to make the photo about the woman. My eyes went straight to her, with her colors and the expression on her face. Again, you have captured and written about an everyday scene of India. I have seen women like this one throughout India. Thanks for the reminder of home. Love the way she is looking at you. She reminds me of one of my aunt's look. Good colors. Stunning photo. Her expression and relaxed pose sets the tone for the photo. Good work.